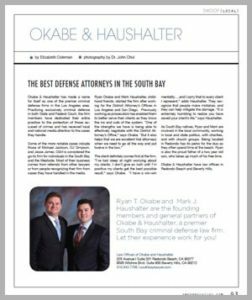 The criminal defense firm Okabe & Haushalter is frequently featured in the news. Read some of the stories and watch some of the interviews! Contact criminal defense attorney at 702-420-2858. Attorney Mark Haushalter was recently interviewed by KTLA in response to alegations that Jesse James, the famed owner of West Coast Choppers and another unidentified man, attacked him a member of the paparazzi while filming outside of the shop. You can read more about the story by Clicking Here . The law firm of Okabe & Haushalter has handled a lot of high-profile criminal defense cases that you’ve probably seen on the news. They were on the O.J. Simpson case. They’ve worked on organized crime and other federal cases. But these Redondo-based defense attorneys aren’t in it for the glory. “We are the 911 of people’s problems,” says Mark Haushalter. NORTHRIDGE – Two 18-year-old suspects were identified Friday in the stabbing of a 33-year-old Northridge man who was found dead in a Porter Ranch park. LAS VEGAS – Lawyers for three co-defendants in the O.J. Simpson armed robbery case lost a bid Thursday to force prosecutors to turn over audio recordings made by the man who arranged the meeting between the former football star and two memorabilia dealers. LAS VEGAS – A key witness has turned over hours of audio recordings in the O.J. Simpson armed robbery and kidnapping case, his lawyer said Saturday. Las Vegas police detectives Friday afternoon raided the Alhambra home of memorabilia dealer Tom Riccio in connection with the O.J. robbery case.